If all that has got you dreaming, you may also be wondering how on earth you are going to afford all this. No one can work miracles, of course, and there remains the fact that top of the range ski properties in good resorts are always going to be expensive, but there may be ways and means of getting a ski property of your own for less money than you may think. A few years ago, there were very few affordable options when it came to buying ski property. Recently, however, the situation has changed beyond recognition. Yes, the top properties in the top resorts are priced accordingly, but property is now available in many smaller or lesser known resorts. Purpose built property is also appearing, aimed directly at the cheaper end of the market, and there is also the possibility of buying a property and renting it out to cover your mortgage costs (Letting property in France) or buying through a leaseback scheme (Leaseback Property in France). This is a scheme introduced by the French government to boost tourism. It involves purchasing a property, then leasing it back to the developer or letting agent for a fixed period of time... usually about nine years. The scheme is perfectly suited to ski properties, as the style of property works well for rentals, the rental incomes are assured and the eventual sale price, should you wish to sell, is usually considerably higher than the initial purchase price. Because you receive a fixed income from the agent, you should find that at least a significant portion of your purchase or mortgage costs are met by the income generated, making owning a ski property a realistic proposition rather than an impossible dream. Leaseback properties are becoming available in a wide variety of places now too, so you can look beyond the major Alpine resorts if you want to keep costs down further (French leaseback property - Top 10). If ski property has always meant the Alps to you, that's fine, and there are some wonderful possibilities to be found in the Alps, as ever, but it is a good idea to consider the other possibilities too, especially if money is tight. France has three mountain ranges that offer good skiing, so you could also consider the Pyrénées, with a really up and coming attitude to ski resorts and development of tourism, or even the Massif Central. 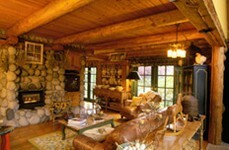 There are perhaps more types of property available in the mountain resorts than at first it may appear. Many people think that the only choices are a chalet made of wood or a concrete apartment. Whilst these are certainly commonplace, the mountain regions of France do offer alternatives. There are, of course, the delightfully traditional wooden chalets and these can range from the fantastic to the economy models... although even at their more basic standards they are not the cheapest forms of ski property available. (Ski Chalets for Sale in France.) The top of the range chalets are straight out of a fairy tale, with fabulous interiors and in perfect locations. These properties are equipped with not only everything you could wish for to ensure a very comfortable standard of living, but also with the latest in ski specialist extras, such as rooms for storing your skis and boots etc. at optimum temperatures, drying rooms for wet ski clothing and jacuzzis and hot tubs for your relaxation and well-being. Chalets of the luxury variety are found in many resorts, both in the Alps and the other mountain areas of France, with some of the most luxurious being sited, unsurprisingly, in the most chic and expensive ski villages such as Val d'Isère (Val d'Isère Property Guide) and Megève (Megève Property Guide). Concrete apartment block for your ski property? A lot of apartment blocks are built from concrete, as this is a very practical solution for this type of construction. Certainly plenty of people are happy to purchase apartments in these types of building, and the utilitarian look of the outside is frequently at odds with the luxury within. For examples of these apartments look at purpose built resorts such as Flaine (Flaine Property Guide). These apartments also frequently offer cheap and cheerful accommodation in the form of small studios, great if you are on a budget and only have a partner or friend to share with rather than a large family or group. Wooden apartment block for your ski property? Not all modern apartments however are built from concrete, and there are some very attractive wooden blocks around that marry the best of both the apartment block and chalet styles. Take a look at some of these types of properties that are currently on the market in Courchevel (Courchevel Property Guide). Modern apartment blocks, whether built from wood or concrete, often incorporate extra features that are a real boon for skiers. There can be communal rooms for ski storage and lockers for keeping your equipment safe and sound. This means that even if you have a small apartment you can maximise the space available without having it cluttered up with bulky ski gear! If you have rejected the idea of a chalet or an apartment or studio for whatever reason, you may be pleasantly surprised to know that it is quite possible to find an old village house, usually of stone or stone and wood construction, to renovate or modernise (House Renovations in France). The traditional villages such as Meribel les Allues (Meribel les Allues Property Guide), or St Martin de Belleville (St Martin de Belleville Property Guide) are the best places to seek property of this type. If you are planning a renovation, though, remember that these traditional villages are very proud of their authenticity, so there is likely to be a restriction on the types of materials you can use, and the features that you incorporate. Why not look at farms and barns for your French ski property? When you think of the ski areas of France you don't usually picture agricultural buildings such as farmsteads and barns, yet these mountain regions are the home of an ancient agricultural tradition. Even in the Alps (Rhône-Alpes Property Guide), it isn't winter all year round, and the mountain cattle and goats thrive on the sweet summer pastures afforded by the mountain climate and clean air. Some of France's most famous and best loved cheeses come from these regions too, so you can see that farms will have been in existence for a lot longer than ski resorts! There are a number of excellent properties of this type on the market at any one time, although they do tend to sell swiftly. Take a look at places such as St Martin de Belleville or La Chapelle d'Abondance (La Chapelle d'Abondance Property Guide) to find rural and agricultural properties suitable for renovation to ski accommodation. Villa or luxury residence for your French ski property? Villas may call to mind the Mediterranean rather than the ski regions of the country, but it is possible to find yourself a lovely villa within reach of the slopes if this is the type of property you yearn for. Annecy (Annecy Property Guide), the elegant town close to Switzerland, has properties of this type on the market, as do the spa towns of Thollons-les-Bains and Évian-les-Bains (Évian-les-Bains Property Guide), but brace yourself… they are not cheap. Also, unlike Mediterranean villas, these will usually come complete with a sloping roof... only wise, really, as you can expect a little snow in winter! What happens to your ski property in the summer in France? Contrary to popular perception, the mountains in France do not close down in summer. Rather, they attract a different crowd of tourists, and offer different opportunities for enjoyment of their unique natural environments. If you love climbing, walking (Finding property in the best walking areas of France), mountain biking, horse-riding, or simply revelling in beautiful scenery and delightful weather, then the ski regions of France can offer as much in summer time as they do in winter. If you are relying on renting out your property in the summer months, then don't worry, as the right property in the right areas will do as well as it will in winter. The best areas in France in which to buy are those with well developed summer sporting facilities, pretty views and a permanent community. Consider perhaps the traditional and pretty La Chapelle d'Abondance, or perhaps think about the possibilities afforded by a town such as Annemasse (Annemasse Property Guide), close enough to Switzerland to attract another crowd of holiday makers altogether! In the Pyrénées (Pyrénées-Orientales Property Guide, Hautes-Pyrénées Property Guide) you might want to view property in areas such as Les Angles or Ax-les-Thermes in the Ariège (Ariège Property Guide), both of which are close to Spain, and also close enough to the tiny tax haven of Andorra to appeal to shopoholics as well as to lovers of mountain scenery and Cathar legends. French ski property, then, can come in all shapes and forms, can suit all kinds of pockets, be found in several different regions of France and be bought and financed in a number of different ways. All of this is great news, as it means that the dream of owning a ski property in this beautiful country of France is not so impossible after all. Ski property | © 2019 Financial Systems Limited and its licensors. All rights reserved. | No unauthorised use of content permitted.